Can anyone assist with identification or information about either of these British cars? The twinshaft motor has the Wainwright style about it, but most unusually, it has twin venturis on either sides of the crankcase, so are these two existing motors combined? 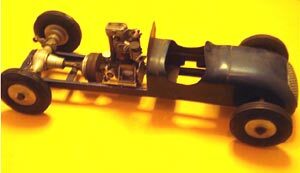 The whole engine unit is sprung with the chassis having Buck 2A rear suspension and steering. 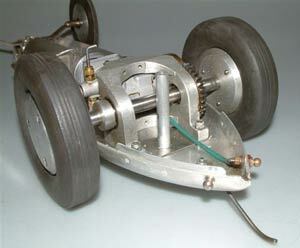 The beautifully built Cooper was a very well crafted scale model but has had some unwelcome 'attention' in the drive department with the fitting of an ETA 29, spur gear bracket and the ZN wheels. The Dowson Lightweight front wheels give a clue as to its date and possible origins. OTW was contacted recently with photos of this lovely car and a delightful story to go with it. The car was bought for my old next-door-neighbour between the ages of 13 and 15 (he is now in his late 70's). When he emigrated 10 years ago he gave me the box as I have always been interested in cars. The box has been left in my mothers garage and two weeks ago she asked me to clean out the garage. I re-discovered the box and opened it for the first time and decided to find out what exactly it was. The car is a very well constructed, home build with direct drive through bevel gears to the front axle. Motor is most unusual, being a 6cc Reeves MK II with the intake below the crankshaft. The bodywork is extremely well built with an integral fuel tank incorporated into the tail section. 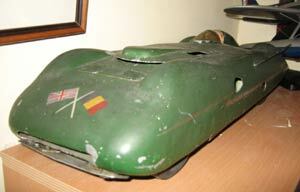 The Forster 99 was also residing in the box, along with spare wheels and tyres. There are still 'gems' out there! This exceedingly well made example of the MG record breaker EX 135 was discovered earlier this year. Very few working models of this prototype were ever built, which makes it a rare car indeed. Coming just 3 months after Lucy Gascoigne's smaller example came onto the market is a remarkable coincidence. It is pictured here as a taster for a full article on both these cars that will feature in next Months OTW edition. A rare ZN axle, ZN air tyres, Nordec clutch, part of an M&E Special body and a Jensen Channel Island Special four stroke motor make this one of the most unusual cars to have come to light. All parts are contemporary and date to the late 1940s. With a wheelbase over 16 inches this is no miniature. There is front suspension by leaf spring and steering, which is bolted up solidly. A wonderful selection of parts have been incorporated in this lovely flight of imagination on someone's part. 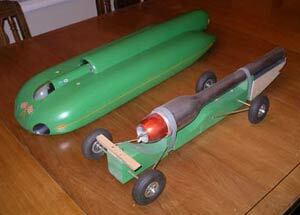 Built as a science project at high school by Ron Christensen, this lovely jet car takes its inspiration from the full sized exploits of the likes of Nathan Ostich and Art Arfons. Unlike them, Ron incorporated a streamlined body shell to his creation. The principles are sound, but knowing how the tail pipe of a pulse jet glows red hot when running, not only might it have been very fast, but very singed. There have been jet cars run in this country but no records seem to exist of the speeds achieved. 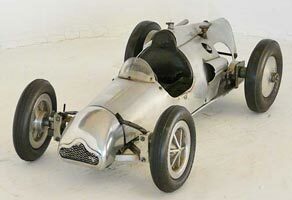 The chassis was built in 1946 by Jack Gascoigne, Jack Morgan and Lucy Gascoigne. The Westbury Kestrel was mounted horizontally, which meant an off set gearbox and front axle. 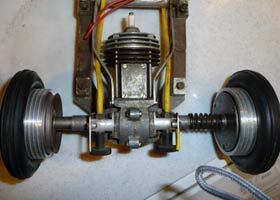 Unusually, the motor is also fitted with a recoil pull start mechanism. Wheels are built up from discs with solid rubber sandwiched between them. The hand beaten aluminium body took almost another year to complete and still represents one of the most amazing pieces of bodywork on a British tethered car. A car from New Zealand, but not a New Zealand car. 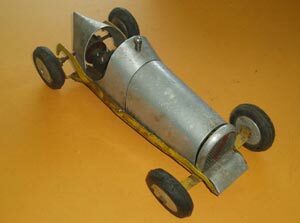 Following the 2nd War, speed flying and tethered car racing were exceptionally popular in Australia and New Zealand. 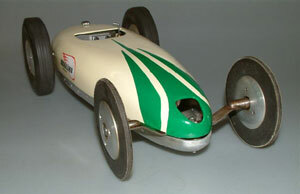 It was almost impossible to procure high performance items from the US or Britain which resulted in a large number of very desirable limited production racing engines and tethered cars being produced' down under'. This car was found in New Zealand and is a well made version of the record breaking 'Moore Dooling Special' built in Derby by Ian Moore and more usually raced by his wife Ivy. It was described in detail as a constructional article in the Model Maker in 1952. The pan and body of the original were hand beaten, but this example looks as if these components have been pressed, and as they are numbered, indicate some form of production run. Motor is the correct Dooling 29. Note the glow plug and earth connection on the tail of the car. This car also illustrates how import duties and the dreaded VAT can turn a realistic 'buy' into an extremely expensive acquisition when brought to this country. MASCO Kittens are relatively common, and many are a lot newer than they pretend to be, but it is rare to find an original such as this. 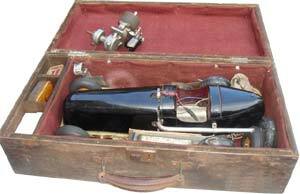 The chassis, running gear, wheels and tyres are all genuine as supplied by the Model Accessory Supply Company. The wheels indicate that it dates from 1948 or later as they changed from the earlier balloon type. 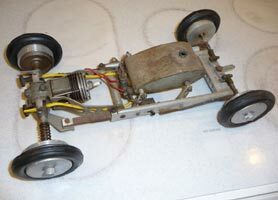 Rear chassis stretcher and steering wheel are missing, but otherwise the car is complete, including the statutory Mills 1.3 motor. There is no gearbox as the car is friction drive, with the whole rear axle assembly being pivoted as a crude form of clutch.